Major Wendell J. Bell, 55, of Swainsboro, GA. passed away Friday, January 25, 2019 at Emanuel Medical Center following an extended illness. 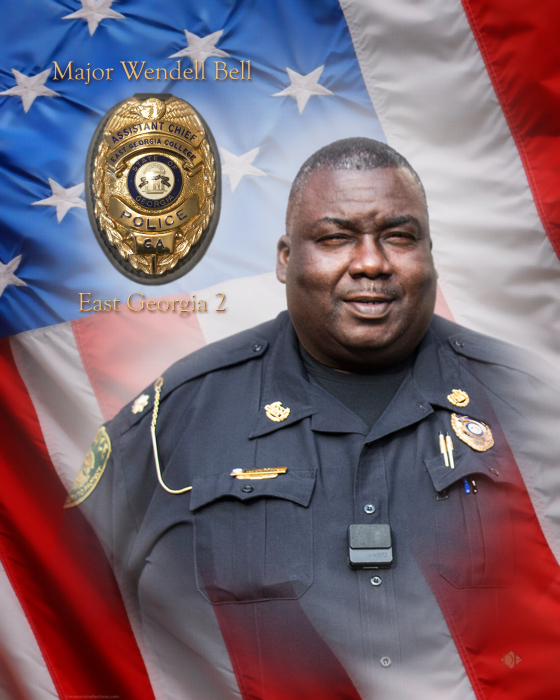 Wendell was born on November 5, 1963 to the late Elex Bell Jr. and Marie Smith Bell in Emanuel County. He was one of seven children. As a child, he attended Emanuel County Schools and like many kids he was very mischievous. His ways changed once he reached high school. He became a very good athlete and was helpful and quiet to his peers. He graduated from Swainsboro High School and went on to serve in the United States Marine Corps in 1982 for four years. Once Wendell completed his tour of duty, he did brick mason work and drove a school bus for a short period of time. He decided to continue to serve humanity by working for the Swainsboro Police Department, Wadley Police Department, Stillmore Police Department and East Georgia State College Police Department. “Bell” as he was lovingly called was honored with many awards for his extraordinary duty to protect and serve. He had many hobbies, one of which was driving trucks. Wendell became owner and sole proprietor of W. Bell Transportation L.L.C. During his early years he married and to that union he had a son Brandon J. Bell. Later in life he met and married the love of his life, Debra Paynes. Wendell loved her and he gained another son and two daughters of which he helped to raise as his own. His love for his wife and children spreads to his grandchildren and other extended family. God chose Wendell to serve his fellow man in many ways, as a son, brother, father, uncle, grandfather, Godfather, Mason member, and friend during his life’s journey. After retiring, due to an illness he was battling, he took time to manage his health and enjoy life with Debra. Wendell’s battle with cancer ended on Friday, January 25, 2019, at Emanuel Medical Center. He was surrounded by family and friends. Wendell will be fondly remembered by his loving and devoted wife Debra N. Bell, two sons: Brandon Bell and Stephen Paynes, two daughters: Kimberly Troupe and Ebony (Comaneci) Walker, one Goddaughter, D’Naria Lovett, four brothers: Matthew (Paula) Bell, Mark (Diana) Bell, Alexander Bell and Wille (Marcie) Bell. Two Sisters: Teresa (Victor) Bennett and Carrie Scott. Ten grandchildren and a host of nieces and nephews and other relatives. Funeral Services will be in the Swainsboro City Auditorium at 12:00 p.m. on Saturday, February 2, 2019 with Minister Joe Cephus, Pastor James Middleton, and Minister Comaneci Walker officiating. Interment will follow in Swainsboro City Cemetery. The family will receive friends 5 pm to 7 pm Friday, February 1, 2019 at Chapmen Funeral Home. Pallbearers are Wesley Lewis, Darien Cato, Gene Brown, Paul Jordan, Willie Williams, and David Way. Honorary Pallbearers Swainsboro Police Department, Wadley Police Department, Stillmore Police Department, and East Georgia State College Police Department. Chapman Funeral Home of Swainsboro is in charge of the arrangements for Major Wendell J. Bell, 55, of Swainsboro, GA.